Ever since Amrita discovered Miley Ray Cyrus, Taylor Swift’s (eventually a host other musicians) music at age 12, she was hooked on country music. She started learning the guitar (daddy taught her the only 3 chords that he knew – the rest, she figured them out herself with the help of YouTube!). She spent hours in her room, practising and singing, and soon, she also started writing songs, a collection of a hundred of them which she had kept secret from us for a long time, until one day, she posted one on YouTube. We were shocked when she told us that it was her original! We had no idea that she could write songs. And slowly, very gradually, over a period of 2 years or so, she let us listen to a couple more of her originals. What can we say? They are GOOD!!! Absolutely original. Not superficial. Very mature for her age. And that’s we think, we have to attribute it to the freedom we gave her, to learn at her own pleasure, whatever that interests her, at her own time, at her own will. And she chose to spend the bulk of it on music and that is fine by us. Most kids who want to pursue music would take the classical music route and enter a music college to pursue it. Amrita chooses to take a different route – she wants to pursue a career in singing and song-writing – country pop to be more specific. 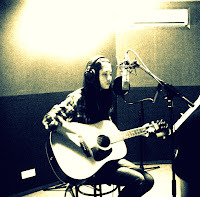 She is planning to go to Nashville in 2012 for the CMA festival where she hopes to further her skills in this area. Please read her blog and give her your full support! This entry was posted in Activities, Homeschooling Kids, Our home schooling experience, Thoughts and Ideas, Unschooling Lessons and tagged Amrita, country CMA, Country Music Fest, creativity, home school, homeschooling, innovation, music, Nashville. Bookmark the permalink.